Vancouver, British Columbia--(Newsfile Corp. - February 12, 2019) - North American Nickel Inc. (TSXV: NAN) (OTCQB: WSCRF) (CUSIP: 65704T108) (the "Company") is pleased to report that assays have been received from two drill holes completed at its Post Creek nickel-copper-PGE sulphide project in Sudbury Ontario. The Post Creek Property is located in the footwall stratigraphy to the northeast of the Sudbury Igneous Complex. Geological mapping has previously identified a north-south trending discontinuous body of quartz diorite which is believed to represent a segmented radial Offset Dyke within a corridor of partially melted and brecciated country rocks that extends from the Whistle embayment structure (Figure 1). Figures may be viewed using the link provided at the end of this release. The 2018 exploration program was designed to test the corridor containing the quartz diorite and brecciated country rocks and consisted of drilling, BHEM surveys, trench mapping, petrography, geochemistry studies, mapping and prospecting. Two holes totalling 969 meters of diamond drilling were completed and designed to provide a platform for BHEM survey work. One hole was drilled beneath an outcrop of quartz diorite and was designed to establish whether the dyke extended to depth and to provide a platform for a borehole geophysical survey. The second hole was designed to test the breccia belt immediately to the north of the trend of the Whistle Offset Dyke (Figure 2). 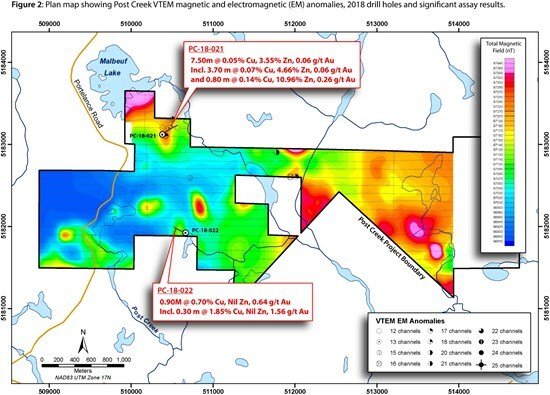 NAN CEO, Keith Morrison, commented: "Post Creek has been held as a NAN asset since 2010 because of its prospective location along the projection of the metallo genetically-significant Whistle Offset Structure. We have been exploring the project with a combination of prospecting, trenching, mapping and our recent drill program. The new discovery of previously unrecognized drill-indicated base metal massive sulphide-type copper, gold, silver and strongly-elevated zinc mineralization substantiates our focused exploration in this area. The results from the 2018 program have significantly expanded our understanding of the signature of the subsurface and the complexity of the geology on the property. These results integrated with historic data will assist us in determining the next steps in evaluating the Post Creek property." Both drill holes encountered a thick sequence of mafic volcanic rocks, but no intervals of quartz diorite or partially melted country rocks were encountered. Footwall style mineralization which typically carries elevated abundances of copper, nickel, and precious metals was also absent. A borehole electromagnetic (BHEM) survey detected multiple anomalies occurring north and south of the mineralization associated with PC-18-021 and are potential drill targets. 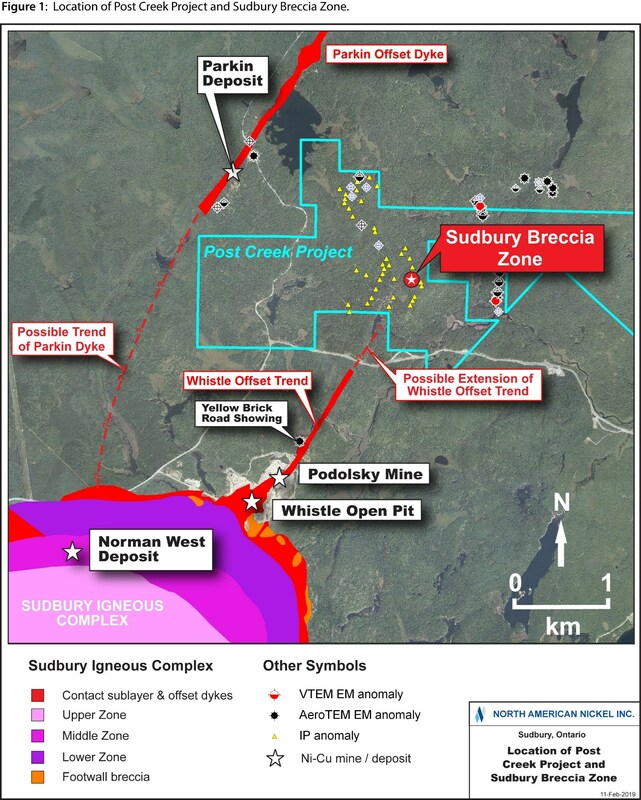 Hole PC-18-022 was designed to assess the possible strike extension of the Whistle Offset in a broad corridor of Sudbury Breccia. The hole was collared in an area with anomalous copper values in outcrop within a well-defined ground magnetic anomaly. A thick sequence of mafic volcanic rocks overprinted with locally developed shear and breccia zones were intersected. One of the shear zones hosted vein-type chalcopyrite mineralization. A strongly magnetic, highly altered ultramafic unit is responsible for the observed magnetic anomaly. Drill collar information and assay results are summarized in Table 1 and 2, respectively. Note: Intervals represent core lengths, not necessarily true widths. No anomalous values intercepted for Pb, Ni, Co, Pt and Pd. Further exploration on Post Creek is planned. The newly discovered zinc-rich base metal massive sulphide-type mineralization and a radiating belt of Sudbury Breccia with anomalous copper and gold assays situated in the southern portion of the property will be the focus of trenching, prospecting, geological mapping, geochemical and geophysical surveys. Exploration will define the limits of the Sudbury breccia and assess its potential to host footwall-vein type mineralization. Engagement and ongoing dialogue with the Wanapitei First Nation will occur as the 2019 scope of work is formalized. The Company is not aware of any legal, political, environmental or other risks that could materially affect the potential development of the project other than those set out in its annual information form filed on www.sedar.com. Please see below under the heading "Cautionary Note Regarding Forward-looking Statements" for further details regarding risks facing the Company. All technical information in this release has been reviewed and approved by Peter C. Lightfoot, Ph.D., P.Geo. (Consulting Chief Geologist), who is the Qualified Person for the Company. The Maniitsoq property in Greenland is a Camp scale permitted exploration project comprising 2,985 square km covering numerous high-grade nickel-copper + cobalt sulphide occurrences associated with norite and other mafic-ultramafic intrusions of the Greenland Norite Belt (GNB). The >75km-long belt is situated along, and near, the southwest coast of Greenland accessible from the existing Seqi deep water port with an all year-round shipping season and hydroelectric power potential from a quantified watershed. This press release contains certain "forward-looking statements" and "forward-looking information" under applicable securities laws concerning the business, operations and financial performance and condition of the Company. Forward-looking statements and forward-looking information include, but are not limited to, statements with respect to the success of exploration activities; impact of mineralogy, estimation of mineral resources at mineral projects of the Company; the future economics of minerals including nickel and copper; synergies and financial impact facilities; the benefits of the development potential of the properties of the Company and currency exchange rate fluctuations. Except for statements of historical fact relating to the Company, certain information contained herein constitutes forward-looking statements. Forward-looking statements are frequently characterized by words such as "plan," "expect," "project," "intend," "believe," "anticipate," "estimate" and other similar words, or statements that certain events or conditions "may" or "will" occur. Forward-looking statements are based on the opinions and estimates of management at the date the statements are made, and are based on a number of assumptions and subject to a variety of risks and uncertainties and other factors that could cause actual events or results to differ materially from those projected in the forward-looking statements. Many of these assumptions are based on factors and events that are not within the control of the Company and there is no assurance they will prove to be correct. Factors that could cause actual results to vary materially from results anticipated by such forward-looking statements include variations in metal grades, changes in market conditions, variations in recovery rates, risks relating to international operations, fluctuating metal prices and currency exchange rates, and other risks of the mining industry, including but not limited to the failure of plant, equipment or processes to operate as anticipated. The Company cautions that the foregoing list of important factors is not exhaustive. Investors and others who base themselves on forward-looking statements should carefully consider the above factors as well as the uncertainties they represent and the risk they entail. The Company believes that the expectations reflected in those forward-looking statements are reasonable, but no assurance can be given that these expectations will prove to be correct and such forward-looking statements included in this press release should not be unduly relied upon. These statements speak only as of the date of this press release. The Company undertakes no obligation to update forward-looking statements if circumstances or management's estimates or opinions should change except as required by applicable securities laws. Although the Company has attempted to identify important factors that could cause actual actions, events or results to differ materially from those described in forward-looking statements, there may be other factors that cause actions, events or results not to be anticipated, estimated or intended. Statements concerning mineral reserve and resource estimates may also be deemed to constitute forward-looking statements to the extent they involve estimates of the mineralization that will be encountered if the property is developed. Statements about the Company's future expectations and all other statements in this press release other than historical facts are "forward looking statements" within the meaning of Section 27A of the Securities Act of 1933, Section 21E of the Securities Exchange Act of 1934 and as that term defined in the Private Litigation Reform Act of 1995. The Company intends that such forward-looking statements be subject to the safe harbours created thereby. Since these statements involve risks and uncertainties and are subject to change at any time, the Company's actual results may differ materially from the expected results. For further information on the project, please see National Instrument 43-101 (NI 43-101) technical report prepared by SRK Consulting (Canada) Inc. (SRK) dated effective March 17th, 2017, titled "Updated Independent Technical Report for the Maniitsoq Nickel-Copper-Cobalt-PGM Project, Greenland", available under the Company's profile at www.sedar.com or at www.northamericannickel.com. Figure 2: Plan map showing Post Creek VTEM magnetic and electromagnetic (EM) anomalies, 2018 drill holes and significant assay results.